Wow your guests with our range of commercial spit rotisserie machines! Each rotates the joint of meat over a coal fire to give the most succulent results that will keep your guests coming back for more. Our range of motorised rotisseries can hold up 60kg or 90kg depending on which machine you choose and each comes with castor wheels so they're easy to transport. 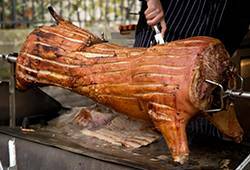 Made from strong and hygienic stainless steel these hog roasting machines are great for catering at big events, garden parties and weddings - but don't worry you're not limited to pork, why not try roast lamb or beef. You can even adjust the height of the spit and attach the triangle grill to hold smaller joints of meat like chicken or gammon and vegetables too. Whether you're looking to expand your catering business or just show off at home, then you can get your hands on one of these griddles with our fast & FREE next working day UK mainland delivery (orders received before 2pm and excludes Scottish Higlands). Want awesome offers for your home and business? © Monster Group UK Limited.